SUNNYVALE, California, February 15, 2011 (ENS) – New research shows a link between use of two pesticides, rotenone and paraquat, and Parkinson’s disease. An international research team has demonstrated that the people they studied who used either pesticide developed Parkinson’s disease approximately 2.5 times more often than non-users. The study was a collaborative effort conducted by researchers at the National Institute of Environmental Health Sciences, NIEHS, which is part of the National Institutes of Health, and the Parkinson’s Institute and Clinical Center in Sunnyvale, California. The authors studied 110 people with Parkinson’s disease and 358 matched controls from the Farming and Movement Evaluation Study to investigate the relationship between Parkinson’s disease and exposure to pesticides or other agents that are toxic to nervous tissue. FAME is a case-control study that is part of the larger Agricultural Health Study, a study of farming and health in some 90,000 licensed pesticide applicators and their spouses. The investigators diagnosed Parkinson’s disease by agreement of movement disorder specialists and assessed the lifelong use of pesticides using detailed interviews. “These findings help us to understand the biologic changes underlying Parkinson’s disease, said Caroline Tanner, MD, PhD, clinical research director of the Parkinson’s Institute and Clinical Center, and lead author of the article. “This may have important implications for the treatment and ultimately the prevention of Parkinson’s disease,” she said. No home garden or residential uses for either paraquat or rotenone are currently approved by the U.S. federal government. Paraquat use has long been restricted to certified applicators, due to concerns based on studies of animal models of Parkinson’s disease. The chemical controls a broad spectrum of weeds. Paraquat is considered one of the most dangerous and controversial herbicides in the world and is the main ingredient in Basel-based Syntengas weedkiller Gramoxone. Its high toxicity and lack of antidote can lead to serious ill-health, and even death. Studies also indicate that paraquat has adverse effects on small mammals and birds, and may accumulate in soil. Paraquat was once promoted by the United States for use in Mexico and Colombia to destroy marijuana plants. Previous research has found that this herbicide is dangerous both to workers who applied it to the plants and to people who smoked the marijuana harvested from them. In Sweden, paraquat has been banned since 1983. In July 2007 the EU Court of First Instance banned paraquat saying that when the European Commission approved its use four years earlier, the required review of literature on potential links between paraquat and the Parkinson disease was not done. Use of rotenone as a pesticide to kill invasive fish species is currently the only allowable use of this pesticide. It is approved for this use by the U.S. Environmental Protection Agency. Rotenone has been used recently to kill invasive Asian carp the Chicago Area Waterway System. The EPA calls the toxicity of rotenone to wildlife and humans “low” and says no poisoning of birds or mammals would result from concentrations recommended for wiping out Asian carp. Rotenone is a natural substance derived from the roots of several tropical and subtropical plants in the bean family. Use of rotenone in North America began in the 1930s in ponds and lakes as a tool to sample fish populations or to completely eradicate undesirable fish populations. 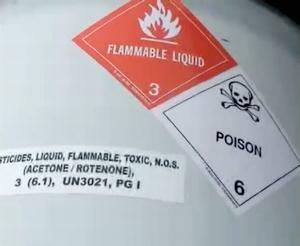 Rotenone is non-persistent, so there is no accumulation in the water, soil, plants or animals. Rotenone quickly breaks down into carbon dioxide and water, but in situations where treated water is likely to move outside of the direct area of application, rotenone must be deactivated with potassium permanganate to ensure that fish and aquatic life outside the treatment area will not be harmed. Scientists from Argentina, Canada and Germany, as well as from the Cleveland Clinic, the University of Kentucky and the Veterans Affairs Pacific Islands Health Care System, Honolulu, also contributed to this research.